Spectacular beachfront property! Completely remodeled 1 bedroom studio with new floors, kitchen, counters, appliances, furniture, bedding, etc. 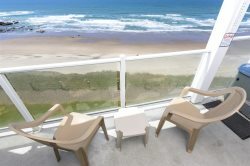 Your “Lookout” to the beach is magnificent with incredible views from the 2 person HOT TUB on the DECK, or the beautiful living room with new Plasma TV, leather furniture, and gas fireplace. Full kitchen with granite counters and stainless steel appliances sits next to the dining room with new cherry dining table. This is the perfect romantic getaway for a couple nights or a couple weeks with on-site beach access and close walk to restaurant(s). You can’t beat the view, location and décor. I already tell everyone I know about this property!! That will probably work against me in the future when I want to book cuz there'll be no reservations available. I love this room. I like that the bed is comfortable and the hot tub is great on the balcony overlooking the ocean. When I was looking for rooms last year, my list of "must haves" included a comfortable bed, a hot tub, overlooking the ocean with beach access, and not a motel/hotel. I found it all here plus more and we'll keep coming back every year. Also, I really like the fully functional kitchen. It was very nice to wake up and make my own breakfast and coffee. The lookout is beautiful. Nice condo with a beautiful view. We very much enjoyed our stay. We have stayed there in the past and will again in the future. From booking, to communication while planning and getting to the condo and enjoying our vacation everything was simple. The staff was friendly and always got back to me in a very timely manner. Amazing! Can't wait to return! It was modern, clean inside and out and smelled fresh. The beach access was close and very easy. The view was amazing. The whole complex was full however not having anyone above you or below you is a huge plus. This was our 4th year using Blue Pacific Rentals. Never had an issue and they are quick to respond to any question or if you need anything. Always get great service and emails are answered almost immediately. Small but very cozy condo. Has all you need for an excellent experience. We never felt cramped or that we were running into each other. Beautiful view and great ventilation using the open slider and the window above the bed. The small window in the bathroom also brings in cool air if needed. We really enjoyed our stay. Excellent hot tub, very comfortable bed. Small couch and chair were also very comfortable. Dining table opened up if you needed more space. Quiet fridge and keep our food nice and cold. Shower had strong pressure to be very enjoyable and heated up very quickly. Drawers for our clothes and a small closet. It went extremely smoothly with a knowlegable friendly staff! Team was very good to work with. Thank you. Loved it and definitely will come back in the future. We enjoyed looking at the different rentals that Blue Pacific Vacation Rentals had. They have rentals for everyone and their different needs. We enjoyed staying at The Lookout for our 15th Anniversary. My husband and I wanted a quiet and peaceful weekend away and that's exactly what we got. We will definitely be coming back. Everything was amazing and we really enjoyed listening and watching the ocean from the hot tub. Thank you for a great stay hope we can come back soon. Everything about the place was a 12 out of 10! Clean, bright, comfy, kitchen ready to use, hot tub was great, wifi was awesome! Was able to stream on my tablet no problem, and having cable with 100+ channels was great as well. Hot tub ready to go kitchen amazing view. The Lookout has a fantastic view and beachfront access. It was comfortable and well stocked with everything you need for a beach stay. It's very romantic with a hot tub on the balcony. Close to everything in Lincoln City. We loved it and can't wait to go back! We will undoubtedly return again for a future stay.